The week 17 Colour Me Positive theme was Friendship and I decided to just work with the broad theme rather than the more focused prompts. 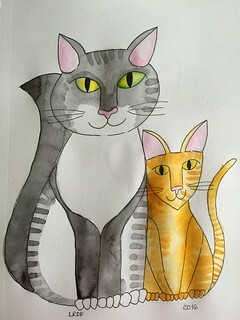 My inspiration was my two cats, Peanut and Satchi, because we Picts are all ever so relieved and glad and thrilled that they have formed a close bond with each other and are firm friends. My kids have been asking me to create an art journal page inspired by our furry family members so the time had come to do so. Short on time, as ever, I did a quick ink illustration and coloured it with watercolour. So here it is, my first portrait of Satchi and Peanut, our fluffy tripod cat and his accomplice, the one we call Peanutter or the Ginger Ninja with good reason. This week’s Documented Life Project prompt was to use vellum. I do not possess any vellum and I had no desire to buy some so I decided to have another whirl at using deli paper. A couple of weeks ago, I used the deli paper as a collage material; this time I decided I would use it as a surface on which to paint. Since we had just spent a fun day at last weekend’s Harry Potter Festival, I decided to actually document my life and work on a Harry Potter inspired page. 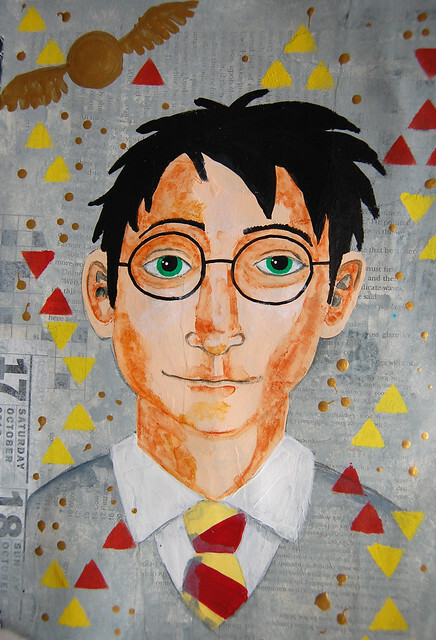 I painted Harry on my journal page and then used washi tape to fix a “flap” of deli paper onto the page. 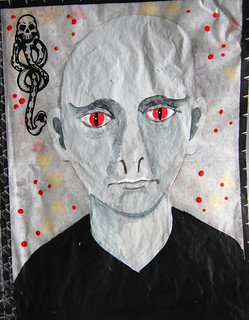 I then painted Voldemort onto the deli paper “page” so that his face covered that of Harry beneath. 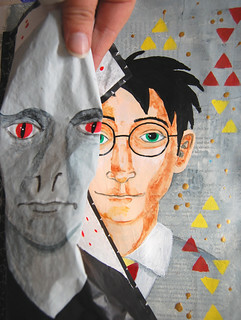 I found the deli paper quite hard to paint on because it was so crinkly and the paint took longer to dry. It was a good way to add a flap since it meant I had an extra page without adding any additional bulk but I think I prefer deli paper as a collage material. This week’s Documented Life Project prompt was to use tissue paper. The idea of using tissue paper in mixed media art projects is that much of the tissue disappears when it is adhered to the substrate so that only the chosen image remains prominent and the rest of the tissue becomes a background layer. Tissue paper is not something I have used in my art work and it is not something I own. I improvised with what I did have which was some tissue paper used for wrapping Christmas gifts. It is not thin enough to disappear but I thought it would “make do”. 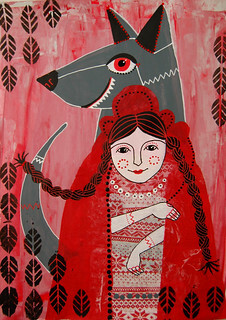 As the tissue paper was red, the idea of Little Red Riding Hood came to mind. I created the clothing and cloak for Little Red out of the tissue paper and used acrylic paint and paint pen for the rest of the page. I like to work with a limited palette so I stuck to red, black and white for this page. It, therefore, annoys me that I mixed the black and white to make the wolf grey; I should have kept the wolf black to make the whole page more cohesive. My stencilling also annoys me as I continue to be too heavy handed and messy with it. Overall, however, I am happy with how this page turned out and my kids – who are my biggest cheerleaders – love the page so I guess this art journal page qualifies as a success. PS If you enjoy seeing my art projects, you might be interested to know that I have embarked on another one which I am sharing over on my art blog. I am altering a recipe book by painting monsters on the pages. October’s theme for the Documented Life Project is use of translucent papers. The prompts for this first week were to use deli paper and the phrase “You had me at hello”. The phrase did not speak to me at all so I decided to just focus on using deli paper. I have some very limited experience of using deli paper in art projects so I was glad of the opportunity to create a page focused on this material. 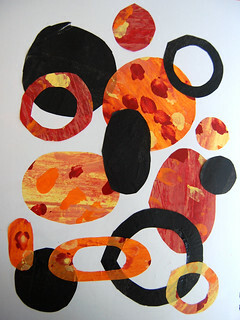 Since I had just returned from a trip to the Boulder Field at Hickory Run State Park, I took my inspiration from the rounded shapes of the boulders and decided to create an abstract page focused on shape. I painted up some sheets of deli paper in autumnal colours, given the turning of the leaves that is happening all around me, and one sheet in black in order to provide some contrast. Once I had cut out my shapes, it was just a case of layering them with overlap so as to make the most of the translucency of the paper. It is a really simple art journal page but I am quite pleased with how it turned out. This week’s Documented Life Project prompt was to construct a storyboard depicting a week in my life. There is nothing inspirational about my average week so I was a bit stumped as to how to embark on the page. I had the option of either depicting a more interesting week in my life, such as a trip, or somehow creating a page out of the everyday and mundane. Technically I should have been thinking in terms of photography too since journaling with photos is still the over-arching theme for the month. I did not, however, have time to take photographs, get them off my camera and print them before working in my art journal so I decided to jettison that element of the prompt. 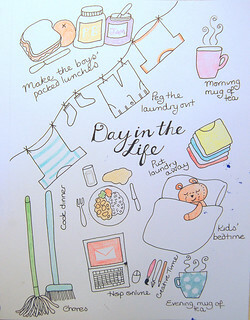 Since for me one average day is much like any other, I decided to depict a day in my life rather than a week. It is just a quick drawing, entirely self-explanatory and as uninspiring as the average day that inspired it. 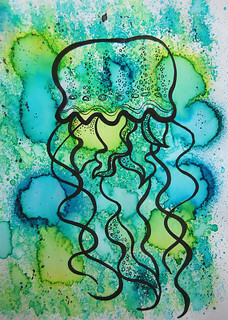 I love to draw jellyfish – as I have shared before in this blog – and I was recently inspired to draw more of them after looking at Leanne Cole’s superb photographs of jellyfish over on her blog. I was itching to get drawing jellyfish but could not seem to find time to make a start. 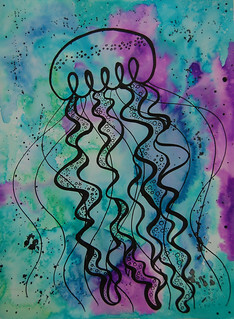 Then the prompt for this week’s Documented Life Project prompt arrived in my inbox and I knew immediately what I wanted to create in my art journal: jellyfish, of course! The theme continues to be photography, which tied into me using Leanne’s wonderful images as the scaffolding for my drawings, and the prompt was silhouette, which I thought I could happily interpret as meaning the strong and black inky lines of my drawings against a bright background. I usually only create one page in my art journal for my DLP challenges but this week I got entirely carried away and made three. Having sketched several jellyfish in my small sketchbook, I could not decide between the three I liked the most. 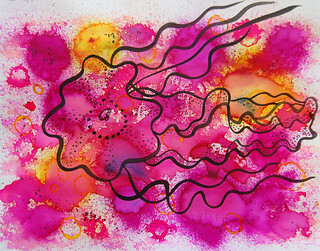 Three drawings was a good excuse to experiment with different backgrounds – spray inks in different colours and watercolour – so I had a lot of fun playing around with the creation of the bright backgrounds and with drawing the jellyfish with a brush and my trusty pot of ancient India Ink. Please do let me know which jellyfish and/or background you like best of the bunch. I have finally made a decision about my next art challenge. It is going to be “Into the Woods”. That theme allows me enough scope to work in different media and cover a wide range of subjects. Since my last art challenge involved a lot of time pressure, I am not going to impose a timetable or deadline onto it. I will just create whenever my artistic mojo strikes but I will – mostly – create in response to this theme. 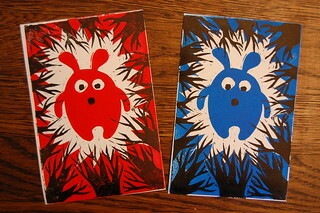 My first work on this theme was a lino block print I have titled “Worried Bunny”. You can read more about it here. I will be sharing the art I produce in response to this theme on my art blog, Pict Ink, so make sure you visit there if you want to see more.